Relevance: A score that indicates how influential a person is to a specific topic based on the keywords you provide. Signals for relevance include keyword mentions, keyword diversity, content production rate, freshness of content and other contextual measures. In this case, it was “social media marketing” as well as 10-plus derivative phrases. Resonance: A score of how impactful the influencer is with their audience. Resonance measures engagement activity that occurs as a result of publishing (mostly social) content. Reach: A score derived by the reach algorithm that takes into account followers, fans, subscribers, visitors and other audience metrics. Remember, this is more than just Twitter. Audience: Unsurprisingly, this refers to overall social audience size. Each of these signal sources are factored into the algorithmic ranking for identified influencers with a focus on topical relevance, resonance of message with the audience and then audience reach. The result is a combination of broad-based influencers as well as individuals with a very specific focus and very high resonance and relevance scores. You’ll see new faces as well as as a variety of disciplines and specialties represented. Many thanks to all who continue to actively share their knowledge about social media marketing through year-round engagement and by providing help to others with insight and expertise in our vast social realm. We hope this list will serve as a handy jumping off point to start your ongoing journey of learning from these leading social media marketing industry influencers. You’ll likely see both many familiar faces and a wonderful variety of new social media influencers. We plan to learn new lessons from these 50 social media marketing influencers and hope you’ll do the same throughout the year. Marketing & Social Media Manager, Kreussler Inc.
Online Marketing Expert & Trainer, Amy Porterfield, Inc.
Statistical analysis, no matter how deep and well-researched, can only go so far in finding the people who you’ll find the most helpful and influential in your daily professional marketing lives, which is why we’d love it if you’d please share the name of social media marketers that influence you most in the comments section below. Some of our social media marketing influencers will be speaking at this week’s Social Media Marketing World 2019 conference, and we’ll have plenty of live-blog coverage of the event throughout the week, from our Senior Digital Strategy Director Ashley Zeckman and Content Strategist Anne Leuman. See where we’ll be here. 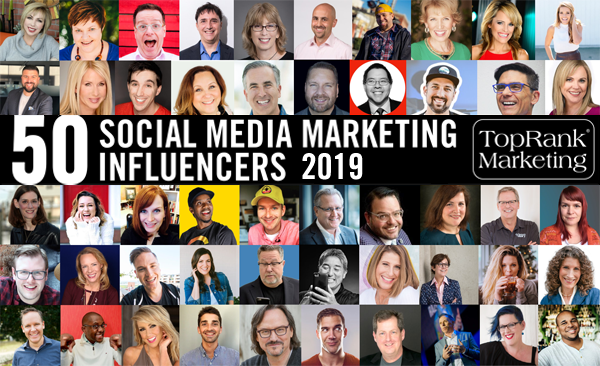 The post Our 2019 List: The Top 50 Social Media Marketing Influencers appeared first on Online Marketing Blog – TopRank®.